The Spector Building at 1800 2nd Street in downtown Sarasota, Florida occupies a full city block. It was constructed by local Sarasota developer Ronald L. Spector, and designed by local architect Donald M. Lawson. The design of the building was inspired by the Mayfair Hotel in Coconut Grove, Miami-Dade County. The Spector Building’s construction took place in two phases; first, the east tower in 1984, followed by the identical west tower in 1985. The final result was completed in 1986 and is a Post Modern style nine-story office building with five floors of covered garage parking and over 500,000 of gross square feet. The brick-clad exterior conceals two central courtyards from which nearly 85 Class A suites are accessed. Indeed, these lush tropical courtyards are not only the most beautiful design feature of the building, but a pleasant surprise to all visitors. Since its construction, the central location of the property continues to offer the benefits of a downtown setting surrounded by the urban amenities of such an address. 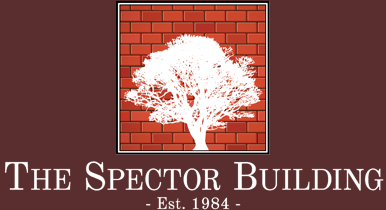 The administration of the property remains in the Spector family under dedicated on site management.